XIV, 307 p., 13,8 x 21,0 cm. 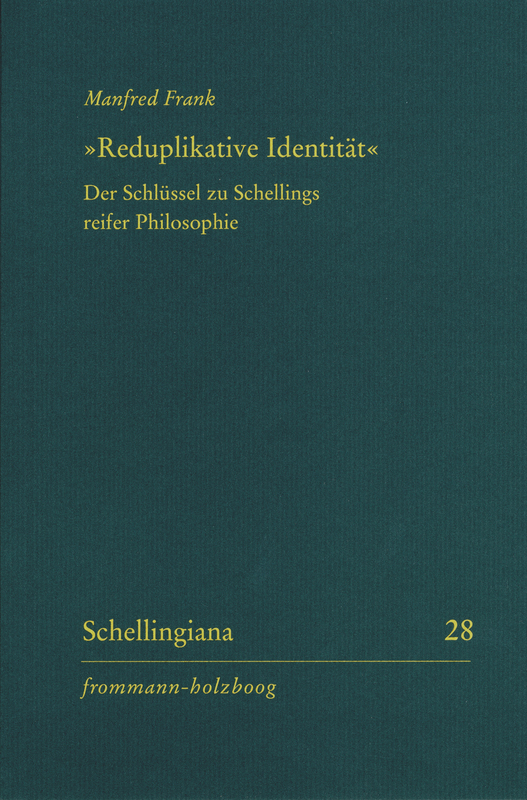 It was not until the publication of Schelling’s Munich and Berlin lectures that we learned the decisive source for his theory of an »identity of identity« or »identity doubled in itself.« Schelling referred to what he called an »older logic that was still acquainted with the figure of reduplication«, for instance in Leibniz and Wolff. Philosophers in this tradition employed this term to refer to the specification of an aspect under which the subject-term is being considered. An often quoted example: »As consul, Fabius Maximus has authority over his father, but as son he stands under his father’s authority.« Schelling gave the following turn to ›reduplication‹: Nature as nature does not coincide with the mind; and the mind as mind does not coincide with nature. Both have different truth conditions, so as to »integrate« an essential moment of difference into the identity formula. There is an X, however, which is strictly (»seamlessly«) identical with itself (the absolute subject = X) while »transitively being« both of them in turn; and it is only via X that the relata (nature and mind) are indirectly identified with each other: ›X is B‹ and ›X is A‹ (and ›X is strictly identical to itself‹). Why should Schelling’s conception of nature-mind identity interest recent philosophers of mind? Because Schelling presents an ontologically neutral solution: Identity is a symmetrical relation that does not favor mind or matter, and prevents the ›idealistic‹ reduction of nature to the mind. Nor can we conceive of the nature-mind identity as a fact inwardly disclosed to the mind (McGinn, Levine). Consciousness remains an enigma for itself; so does its identity with nature. Schelling teaches us that identity theories are not justified by self-evidence, but by an inference to the best explanation.